According to LastBroadcast.co.uk Casino Royale ranks ninth for best-selling DVD in the past 10 years (might as well say “of all time”) in the UK surprisingly beating out Harry Potter and the Goblet of Fire which came in at #10 and is the only Harry Potter film to make the list. Casino Royale was the best selling title of 2007 for both DVD and Blu-ray and obviously with that stat it ranks #1 on Blu-ray’s top selling list of all time. Of course, lest we forget at least 500,000 of the Blu-ray edition were given away for signing up for the PlayStation Network (PS3) and recently it was bundled again with the PlayStation 3. 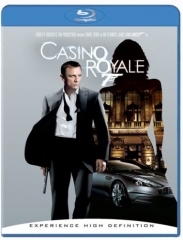 According to the report Casino Royale on DVD has currently sold 3.1 million units in the UK. I’m curious to see how it’s been doing in the United States since we last heard.